The people who find opportunities and qualify prospects for your organization are vitally important to your success, so today we’re discussing how to become a great sales development rep. 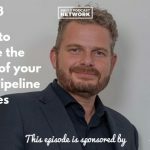 In my own experience as an SDR (some organizations call them inside sales) I discovered that the SDR role primarily prepares sellers to work in outside sales. It’s a position designed to keep you hungry and to transition you to outside sales where you would learn to find your own opportunities. 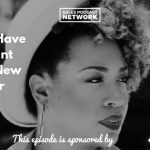 I wanted to get out of the SDR role, but I had to prove myself first in order to meet my goal of becoming an account executive. 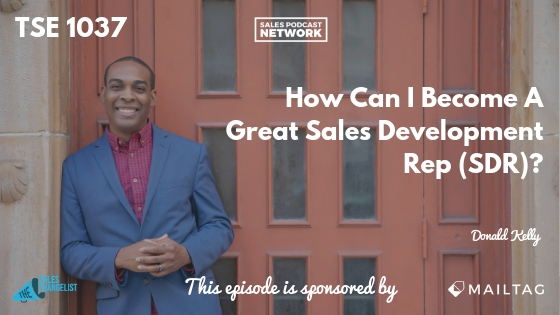 This episode of The Sales Evangelist is a reboot of a 2017 episode, but all the concepts apply to SDRs today. The following 5 steps helped me succeed as an SDR. If you’re an SDR you have to understand the rules that govern your work. It’s also important to recognize the two different objectives that SDRs must address. Setting appointments involves finding people, listing information, and booking meetings. Creating opportunities demands more of your effort because it demands that the SDR qualify the individual and to do a little more digging and a little more prep prior to the AE taking over the account. For a complex sales process, qualifying people ahead of time decreases the chance that the appointments will flop. When the SDRs clearly understand their objective, they will be more likely to succeed in their efforts to generate new opportunities. Some sellers use a “dialing for dollars” approach, and there’s nothing wrong with that technique if it works effectively. In my own experience, I found that setting specific times to prospect helped me be more successful because there were certain windows of time where my efforts worked best. I discovered that the best time to make phone calls was between 8 and 10 a.m., then again between 12 and 1 p.m., and finally between 4 and 5 p.m. I strategically called during the times when I knew they’d be most likely to answer. Then, I used the windows of time in between to send emails and engage in other outreach activities. Don’t be governed by your role as a seller. Instead, you govern your role. 3. Learn from effective SDRs. Determine which SDRs are doing really well in the company and mirror what they do. You’ll learn terminologies, tactics, and strategies that you didn’t previously know. Be open to learn from others who are successful in the role. Try things that look worthwhile and disregard the others. Be a sponge, and if you see a better way of doing something, just try it yourself rather than correcting their efforts. When a prospect tells you “no,” don’t read too much into it. He isn’t insulting your family line; he simply isn’t ready for what you’re offering. Set rejections aside and move on to the next prospect. If he isn’t ready right now, put him into a drip campaign and stay in touch with him until he is ready for what you’re offering. “No” also helps you disqualify people so you can focus your efforts on those prospects who are ready for what you’re offering. It sounds counter-intuitive, because as an SDR, your job is to put numbers on the board. When we get greedy for numbers, however, problems often occur. We’re so hungry to schedule something so we can meet our KPIs that we get desperate and let everyone pass through the process. Oddly enough, when you seek to disqualify, you’re better able to qualify the right people. If the person doesn’t meet the qualification, don’t pass him on to the next level. Being selective improves your odds of success throughout the process. Bonus: Sit with your AE. If you’re setting appointments for an AE, sit down with her regularly so you’ll know where your focus should be. Are there certain industries you need to focus on? By working together, you’ll both be aligned to achieve success. Grab a copy of The Sales Development Playbook: Build Repeatable Pipeline and Accelerate Growth with Inside Sales.